Planning a destination wedding is so much fun for a plethora of reasons — how could it not be as you chose paradise for the big day?! But it comes with it’s own set of challenges and etiquette rules — some of which are in your control and others (like a potentially laissez-faire attitude of your island vendors) that are simply not. Many of your decisions leading up to your long weekend (or week!) are made from afar, which can feel stressful. The key is to plan as best you can and then let the rest go and unfold along with your journey, enjoying this incredibly heart-warming time with those who have traveled from all over to celebrate your union. Here are 10 tips to help you plan smart for your destination wedding. If it’s in your budget to do so, hire a great wedding planner who is located in or near your destination. She or he will guide you to the best venues and local vendors for your budget, create a planning timeline and take tons of stress off your shoulders. Tip: Try not to rely solely on the event coordinator at a hotel or venue, who often has his or her own agenda. If you don’t have a budget for an outside wedding planner, add some time to your wedding planning schedule to scout out your own vendors or interview the ones the venue’s coordinator has recommended. Make sure to review their work online through videos and photos of real weddings, and request referrals from other brides. You can also arrange a Skype to interview them face-to-face if it’s too far to travel. Decide as a couple what your ideal headcount number is, and then make a list of all your closest friends and family members. From there, you may have to make some cuts or you may have wiggle room to slip in some “second-tier” friends. Inevitably, someone you leave off the list may not be too happy about it. Hopefully, they’ll understand, though, considering you are “keeping the guest list small.” Remember: It’s your day, your way! This answer is really up to the atmosphere that you would like. If the answer is no, make sure to communicate this directly (as in, pick up the phone, not via email or text) to friends and family with children, regardless of how you address your invitations. If yes, of course, factor them into your headcount, and think about things like a potential nanny service for guests should your wedding be an evening event. When do invitations go out? Mail save the dates early so guests have time to plan their travel — up to nine months in advance is good if they are traveling quite a ways away. Invitations can be sent three to five months in advance. Don’t forget to go online and pick your favourite wedding invite! What should you include on the invites? 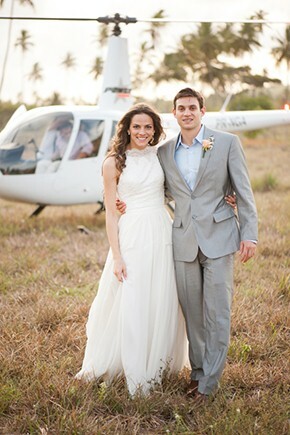 Destination weddings require many more details than your average hometown affair. Instead of cluttering up your pretty invitations, create a wedding website and direct guests to the URL on the invites. How many guests will decline? This depends how far and expensive the trek is, but don’t assume your peeps won’t come — they might surprise you! Factor in that about 20 percent will say “no,” just like you would for a wedding in your hometown. Every location will have its own set of rules to follow in regards to obtaining your marriage license. Some places might even require you to be there a few days in advance of the wedding. Be sure to research these logistics and legalities prior to selecting your destination. How much should you tip vendors? Appropriate tip amounts vary from destination to destination. Your best bet is to ask your wedding planner or hotel what is appropriate — and don’t forget to factor tips into your budget, too. How detailed should your welcome-bag itinerary be? Pretty detailed. Guests will be kicking back as it’s also a mini vacation for them, so include everything they might need to know, including where to be when and suggested attire for all of your events. Have any must-share tips about planning a destination wedding? Do share here or on our Facebook page. Thanks!